Wanna see fresh new acts before anyone else? Or just want to have a good time? 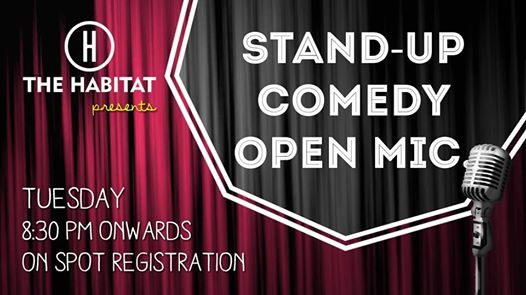 The Habitat's Standup Comedy Open Mic is the perfect platform for you to showcase your comedic talents and who knows, maybe you'll get a spot in a feature show! All you have to do, is get a friend with you! Spot Registration sheet will be present at 7.30 pm outside the venue till 8.15 pm, until which you MUST make the payments for yourself and your plus one of Rs. 200 (full cover) per person to register. 25 registrations will be available on a first-come-first served basis. First 10 spots will be guaranteed. The next 5 spots will be given through a lottery, for a total of 15 spots. **Open Micers shall not be allowed as plus ones. In case your plus one is an open micer, you will still be allowed to perform, but your plus one will be banned from performing at the venue. ***The host and organisers hold the right to modify/cancel/add to the spots at any given point in time, without prejudice. ****Spots in weekend and curated open mic maybe given on the basis of this mic at the discretion of the establishment. The host and organizers hold the right to modify/cancel/add to the spots at any given point in time, without prejudice.